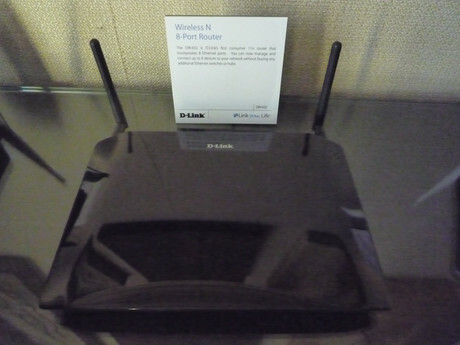 Home > Latest News	> Do You Have Enough Friends For D-Link’s DIR-632 802.11n Router? D-Link’s giving your popularity the benefit of the doubt by offering 8 Ethernet ports on their new DIR-632 802.11n router. If you’re worried about all those open ports bumming you out, D-Link has 3 other new devices to check out. If the DIR-632’s 8 ports seem like overkill, there’s the D-Link Rush (DAP-1560), the Touch (DAP-865), and a new 802.11n pocket router that has no epithet. The Rush is a secure, powerful access point designed to beef up your current home network for bandwidth intensive content, like HD movies. The Touch, as its name suggests, has a 3″ touch screen for, you know, changing all those settings you change on your router. The pocket router can function as its own router or as an access point, extending an existing network. LAS VEGAS, CES Booth 36232, South Hall, LVCC, Jan. 6, 2010 – D-Link today announced three innovative 802.11n wireless devices for the home – one that boosts network speeds to unprecedented levels for existing routers, another that combines high speed and range with stylish functionality in the digital home, and yet another that offers convenient wireless connectivity on the go. The D-Linkâ Rush™ (DAP-1560) is D-Link’s fastest, most far-reaching and most secure wireless device yet. It takes home networking to a new level of performance for homeowners who demand the fastest streaming possible of high-definition content, such as movies, HD video and photos. There is no need to replace the home router – its unique 4×4 antenna design helps boost the power of any existing 802.11 a, b, g or n router with up to 600Mbps* speed and greater signal coverage. The dual-band selectable device transmits in 2.4GHz wireless band for applications such as surfing the Internet or in 5GHz wireless band for HD media streaming, online gaming and large data file transfer. The latest D-Link AP can also be used as a wireless client to Ethernet-enabled media devices such as video game consoles, Digital Video Recorders (DVR), and Digital Media Adapters (DMA) for seamless access to the Internet. The D-Link Touch™ (DIR-865) blends power, speed, range, security, functionality and energy efficiency into one economical and attractive router for homes or small businesses with ever-growing multimedia applications. It sports a 3-inch interactive touch screen for easy setup, configuration and management of the router and Internet traffic. Its concurrent dual-band capabilities and three data streams support data transfer rates up to 450Mbps*, allowing users to stream HD content faster than ever before in the 5GHz wireless band, while surfing the Internet without lag-time and checking email on the 2.4GHz band. The 802.11n Wi-Fi router is backward compatible to earlier standards (802.11 a/b/g). The D-Link Wireless N Pocket Router is an ideal travel companion featuring multi-mode functionality. It can be used either as a wireless router to create an 802.11n Wi-Fi network anywhere one is needed, or as an access point (AP) to add Wi-Fi to an existing wired network. It is small enough for travellers to carry with them, includes a travel case for convenience and SharePort™ technology to enable users to share USB devices. The device also can be used to connect an Ethernet-ready device, such as a desktop PC or Xbox 360®, to a Wi-Fi network for increased flexibility and convenience. Lightweight and compact with its own travel case, the Pocket Router is small enough to carry while traveling and sets up easily to share an Internet connection or connect to an existing wired network in a conference room, hotel room or anywhere a Wi-Fi network is needed. It delivers powerful 802.11n performance and offers the latest wireless security features to help prevent unauthorized access. The D-Link Rush, the D-Link Touch and the D-Link Wireless N Pocket Router will be available in the first half of 2010 through the company’s network of retail and etail outlets, and at D-Link’s online store, http://www.dlinkshop.com. Pricing will be announced when the products ship.